Depression: According Pubmed Health: Depression is a state of low mood and aversion to activity that can affect a person’s thoughts, behavior, feelings and sense of well-being (moderate or severe). Vestibular disorders and anxiety are closely related, probably because they share some neuronal pathways. Ageing and patient comorbidities are important facilitating factors, and multiple vascular risk. Depression is a condition in which a person feels discouraged, sad, hopeless, unmotivated or disinterested in life. Depression and anxiety disorders are common at all ages. The shared cornerstone of anxiety and depression is the perceptual process of overestimating the risk in a situation and underestimating personal resources for coping. The aim of manuscripts published in Insights on the Depression and Anxiety is to accentuate how the frequency of depression and anxiety rates are related to biological, lifecycle, hormonal and psychosocial factors of human beings. 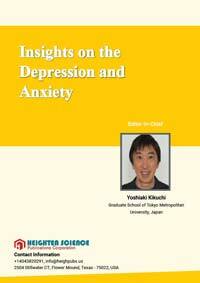 The scope of Insights on the Depression and Anxiety assimilates publishing all the updated and innovative investigations in the progression of depression and anxiety disorders.